This weekend I convinced Jacob to drive all the way across town for breakfast at a little place called Verde Cocina in Hillsdale. I had recently driven past during my evening with the Portland Fruit Tree Project and the place looked so cute, I was set on going back. Other than looking fun, I also knew they served Mexican food and they’d been recommended on Eater PDX a few times specifically for their brunch. For me, mexican breakfast is huevos rancheros, chilaquiles, cheese, beans, tortillas and some fresh squeezed orange juice to wash it all down… but that is not what you get at Verde Cocina. I failed to notice before convincing my biscuits and gravy obssessed husband to drive across town that this was health food place. Oops! Not what I was expecting and totally not his type of eating. 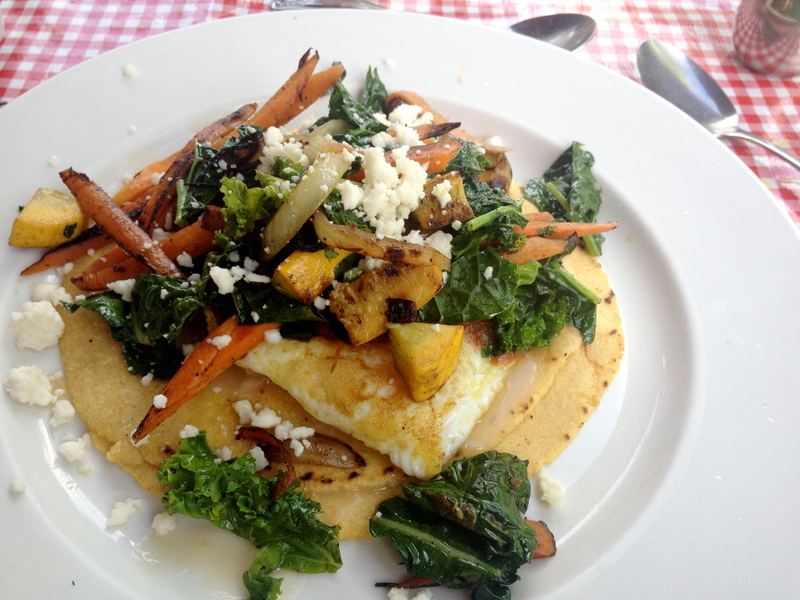 I still ordered the Huevos Rancheros, but I never would have recognized it under the pile of kale and carrots that showed up in front of me. Don’t get me wrong. I love kale. I eat it a few times a week, but when you’re expecting a pile of cheese and instead you get a pile of greens, it’s a little bit of a let down. But if you’re looking for a healthy breakfast spot this place is great. My food was good. The eggs were perfectly cooked, they have a nice garbonzo mash instead of refried beans and it was all piled on top of two fresh tortillas. 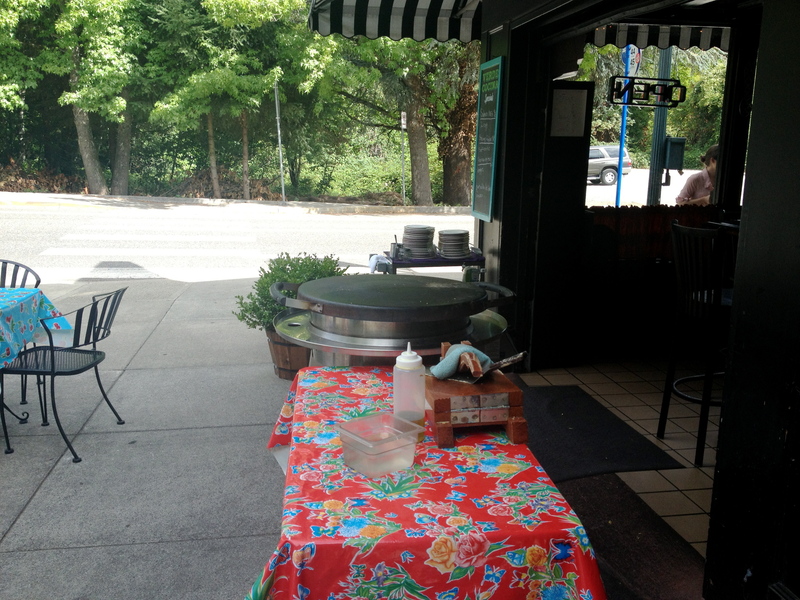 They make tortillas on a grill out front. Poor Jacob. 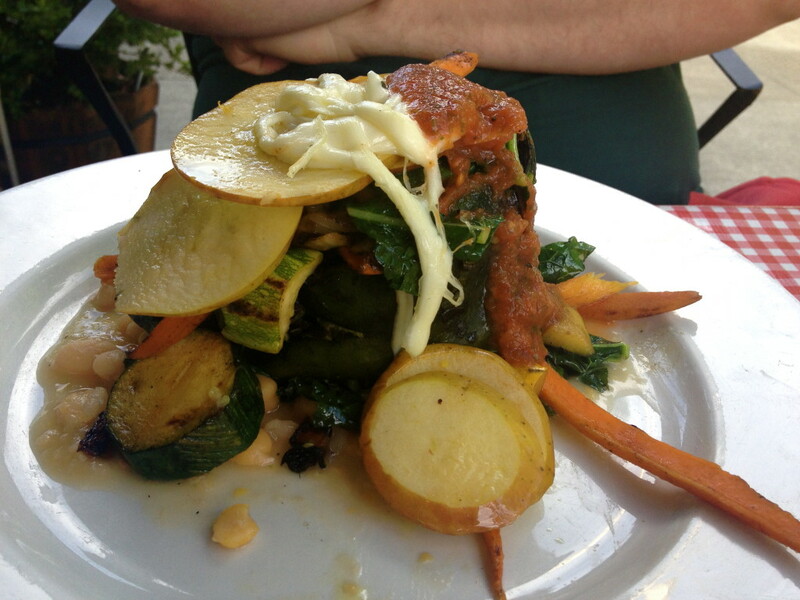 He ordered Chile Relleno, expecting something fried and cheesey… instead it was just roasted, stuffed with quinoa and topped with a pile of roasted vegetables. Again, beautiful presentation, made with top notch produce, but seriously lacking the fat we were expecting from mexican food. As soon as the server brought it out, I realized I needed to do something to salvage this meal and fast… so I ordered a side of bacon… and it saved the day. Wow. It was excellent. They serve it in big fat cubes rather than strips and it really hit the spot for both of us. 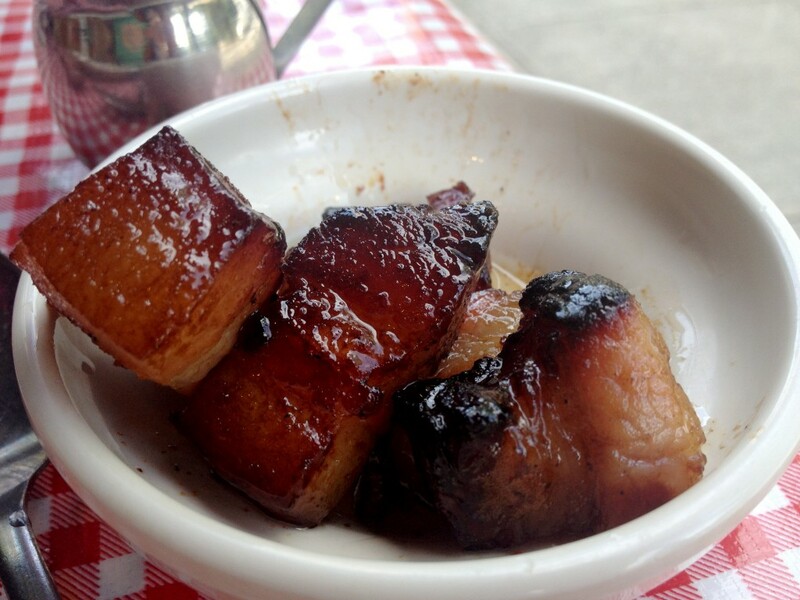 Salty and sweet, meaty and fatty. With a sheen of grease that helped the kale and quinoa settle in our stomachs. So, this is kind of a mixed review, which I feel bad about because this is NORMALLY the type of place I love. But this weekend it was too healthy for me. (I can’t believe I just typed that.) Still, I would totally recommend this place. It’s excellent for vegans and vegetarians and for anyone looking for a healthy meal. 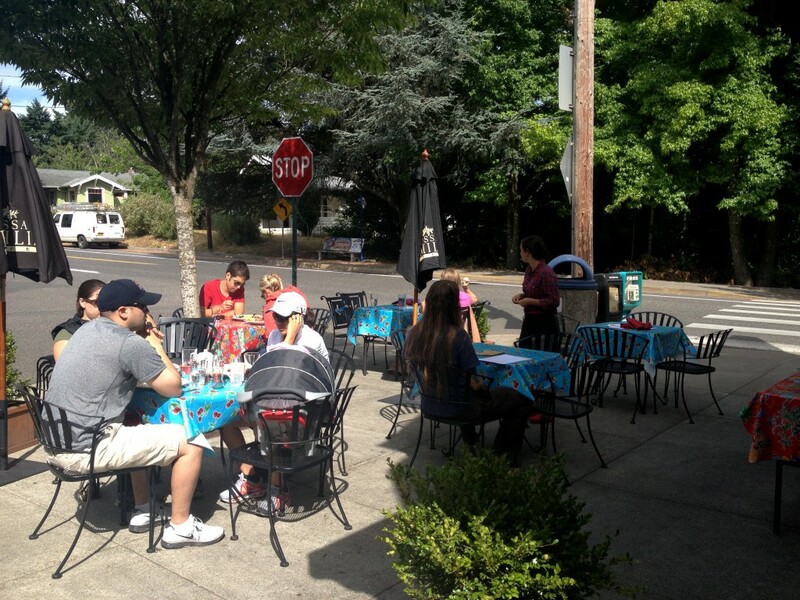 The Hillsdale location is mostly outdoor seating, so it’s great this time of year. They have a second location in the Pearl District (which did not open early enough for us this weekend) and both locations serve dinner. They also had a pretty nice looking cocktail menu. Tequilla goes well with kale, right?